What is a bishops' storehouse? What Is a Bishops’ Storehouse? “And again, let the bishop appoint a storehouse unto this church; and let all things both in money and in meat, which are more than is needful for the wants of this people, be kept in the hands of the bishop” (D&C 51:13). The bishop has the responsibility to care for the poor and needy within the boundaries of his ward. 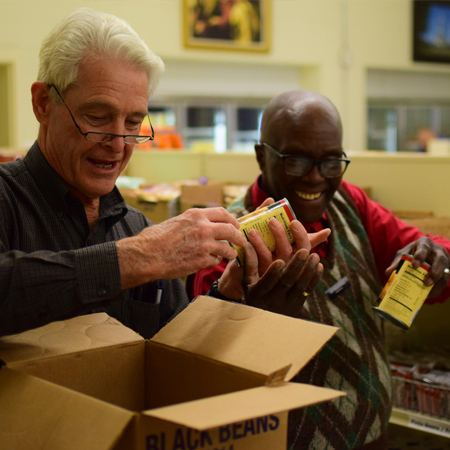 One resource available to accomplish this task is the bishops’ storehouse—a place where those in need can go to obtain food and other supplies at the recommendation of their bishop. The storehouse is filled with commodities provided by fast offerings and other generous donations from members. Food and supplies from the bishops’ storehouse can also be sent to those affected by natural disasters, wars, or economic crises at a moment’s notice. What Is the Bishop’s Role? The Lord has directed bishops to actively “[search] after the poor to administer to their wants” (D&C 84:112). One way bishops do this is by meeting with members of their wards or communities to discuss their needs and to make a plan that will help them become self-sufficient. Bishops are blessed with the gift of discernment (or the ability to know something by the Spirit), which helps them understand how best to help those in need. Bishops are responsible for keeping the welfare needs of those who speak with them confidential; they only share information with priesthood or Relief Society leader as needed to provide assistance. Bishops ask those who receive assistance to work for the help they receive in whatever way they can. These work assignments provide them with an opportunity to give back in a meaningful way. Ezra Taft Benson taught, “It is a law of heaven, and one we haven’t learned fully here on earth, that you cannot help people permanently by doing for them what they can do, and should do, for themselves” (Ezra Taft Benson, “Ministering to Needs through the Lord’s Storehouse System,” Ensign, May 1977, 83). Brigham Young further explained this doctrine when he said, “True charity [consists of] placing [others] in a situation in which they can support themselves” (in James R. Clark, comp., Messages of the First Presidency of The Church of Jesus Christ of Latter-day Saints, 6 vols. [1965–75], 2:134). Ultimately, the decision of who receives welfare assistance rests with the bishop. He is the Lord’s chosen servant and is responsible for providing assistance to the poor and needy in his appointed area. He has “the sole discretion in caring for … the poor of the Church. … It is his duty and his only to determine to whom, when, how, and how much shall be given to any member of his ward from Church funds and as ward help” (J. Reuben Clark Jr., unpublished article, July 9, 1941, as cited in Ensign, Nov. 1976, 112). How are they funded and maintained? All of the goods in the bishops’ storehouse are paid for using tithes, fast offerings, and other generous donations from Church members. “And the storehouse shall be kept by the consecrations of the church; and widows and orphans shall be provided for, as also the poor. Amen” (D&C 83:6). 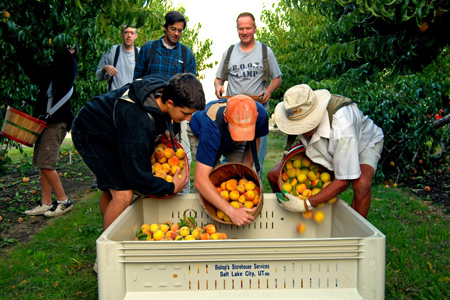 In addition to monetary contributions, members volunteer their time to produce and process the food. Bishop J. Richard Clarke taught that both donor and recipient are sanctified through service. He said, “Through the fast offering, we are distributing our expressions of love through the bishop to the one in need. This is the Lord’s way, wherein both giver and receiver are blessed to the ultimate salvation of both” (J. Richard Clarke, “The Storehouse Resource System,” Ensign, May 1978, 84). “Bring ye all the tithes into the storehouse, that there may be meat in my house, and prove me now herewith, saith the Lord of hosts, if I will not open you the windows of heaven, and pour you out a blessing, that there shall not be room enough to receive it” (Malachi 3:10). Storehouses are operated almost exclusively by a staff of volunteers and Church-service missionaries, who are called and set apart by their stake presidents. In some cases, a paid manager may oversee and direct the work. What products can I find there? 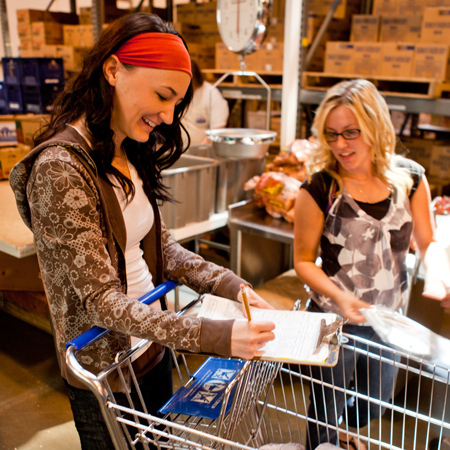 Storehouses provide the same types of goods found in any grocery store, including canned goods, condiments, cooking products, fresh produce, milk, meat, and pasta. Personal hygiene products and household cleaning supplies are also available.